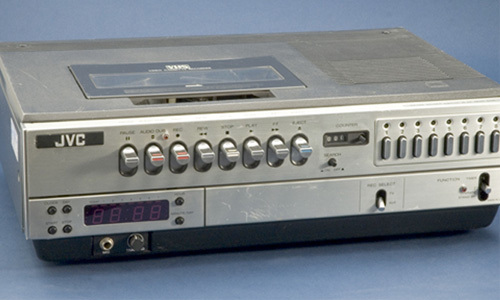 JVC made the first commercial VHS player/recorder. Okay, I’ll admit it: I didn’t have a clue as to what a VHS Recorder was until CBS came to our school in order to report on our “State Animal” contest in 1980. My class represented the River Otter. At the time, kids were going to choose the state animal of Illinois. I missed the report on the news, but my friend Ira said he “recorded” the news. I didn’t understand what he meant. My mom drove me over to Ira’s house and I saw what looked like a tape recorder that had taken a power pill and had become five times bigger. I couldn’t understand why it was connected to a TV set. But once Ira hit play, my eyes lit up in fascination. It was like the scene in the first Jurassic Park where they first see dinosaurs. JVC built the first VHS VCR, which went on sale in 1976. By the time I saw my first VCR in 1980, they still weren’t mainstream. That meant that in order to see a program, you had to watch it at the exact same time it aired. How depressing! We certainly take things for granted these days. There was also the Betamax VCR, which Sony released in the United States in 1977. The Betamax and VHS formatted VCR systems fought it out, but by the early 1980s, VHS won. By 1985, it was very rare to see people still buy Betamax VCR systems. My family was late to the party. We didn’t get our first VHS system until the end of 1985. It was a Panasonic. The first movie I rented was I Spit On Your Grave. Please stay away from this movie at all costs! But the next one I rented, Nightmare On Elm Street, still scares the heck out of me until this day. I didn’t get a chance to see it in the theaters when it first came out. Watching movies that were previously only in movie theaters was only half of the excitement. It was so cool that I could schedule recordings of Saturday Night Live (even though 1985 was — perhaps — the worst season), Dallas, and even Family Ties. I could study during the week and watch all my programs during the weekend. As the 1980s progressed, so did VCR systems. 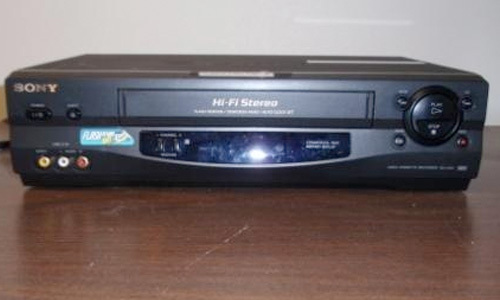 The popularity of the VHS player/recorder faded in the 1990s with the arrival of the DVD player and the first mainstream DVR player, TiVo. By now, you hopefully converted your important VHS tapes to DVD. But wait, even the DVD player is becoming obsolete! This entry was posted in Review and tagged VCR, VHS. Bookmark the permalink.